If we look at the day so far, examining the table of the earthquakes around the world as shown in the Table below from EMSC, where we see all the >4R events. 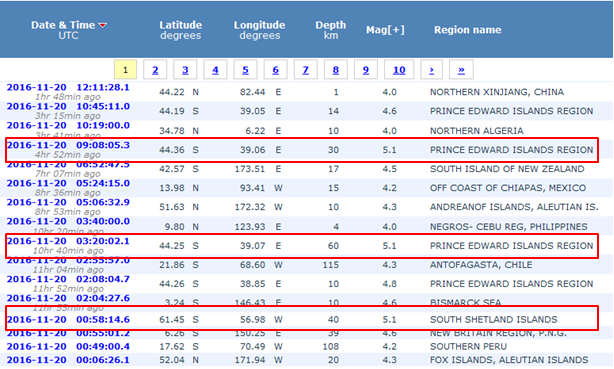 We have three 5.1R earthquakes, a double event in Prince Edward Islands and anothe in South Shetland Islands early this morning. All of those three events are far from populated areas I think. All other events are less than 5R. We have had events in PNG, Peru, CHile, Mexico NZ, Algeria Philippines and China so far. China for example we expected it yesterday and it is here delayed. It is already 14:00 GMT and therefore we will wait and see how the rest of the day develops.